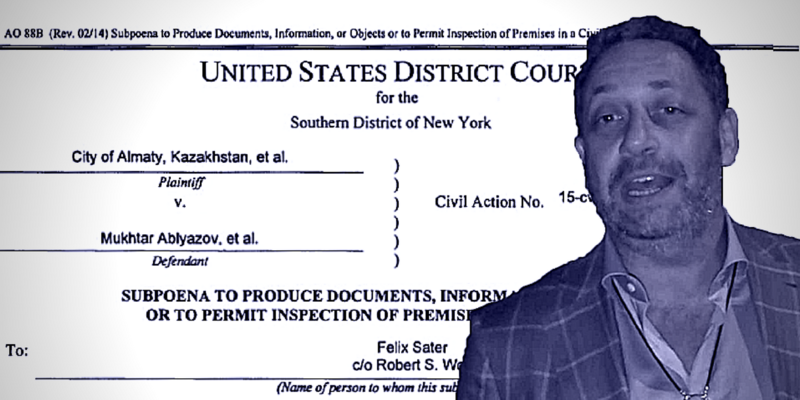 Former Trump adviser and business partner Felix Sater has been served with subpoenas in the Southern District of New York (SDNY) relating to a high-profile money laundering case. The two subpoenas were issued on October 27, 2017, and required Sater to produce documents and sit for a deposition. The two plaintiffs in the Manhattan case are Kazakh government entities — BTA Bank and the city of Almaty, Kazakhstan. The defendants include three fugitive Kazakh officials who allegedly laundered hundreds of millions stolen from BTA through U.S. real estate deals. One of those deals included the 2013 purchase of three condos in the Trump Soho Hotel. Two subpoenas issued to Felix Sater from SDNY on October 27, 2017. According to court filings, Sater had not yet complied with the subpoenas and a motion to compel him was made on January 8th. The subpoenas were issued by a lawyer representing Triadou SPV S.A, a Luxembourg-based investment firm that is both a co-defendant and cross-defendant in the case. In the motion, Triadou’s lawyer noted that despite their efforts to obtain discovery and schedule a deposition, she had “not received any substantive responses or documents to date.” As of January 12th, however, Triadou’s lawyer had issued a motion to stay, indicating Sater is now willing to cooperate with the discovery and deposition requests. 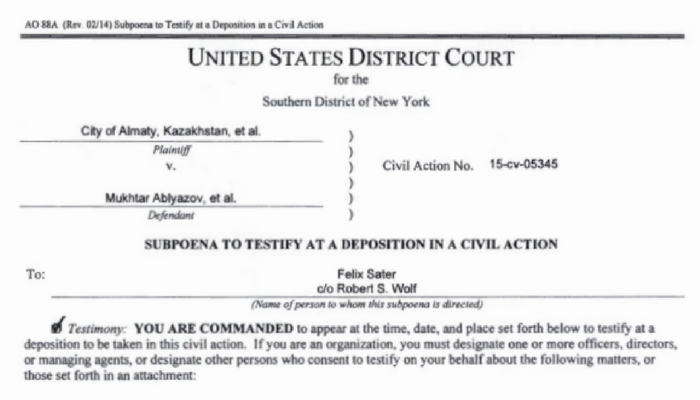 The SDNY case was filed in 2015 and names former BTA Bank Chairman Mukhtar Ablyazov, former Mayor of Almaty Viktor Khrapunov, and his son-in-law Ilyas Khrapunov among the defendants. The City of Almaty and current BTA representatives claim that Ablyazov used his position at the bank to issue loans to dozens of his own shell companies. The Khrapunovs purportedly conspired on the scheme and helped funnel some of the stolen money out of the country to enrich themselves. In total, Ablyazov is alleged to have stolen $4 billion from BTA Bank before fleeing to the UK in 2009 and then to France in 2012. The Khrapunovs also fled Kazakhstan, and have been living in Switzerland. The trio continued their money laundering activities while fugitives in Europe. They created Swiss and Luxembourg-based investment companies that used European banks, including Deutsche bank, to continue moving assets around the globe. 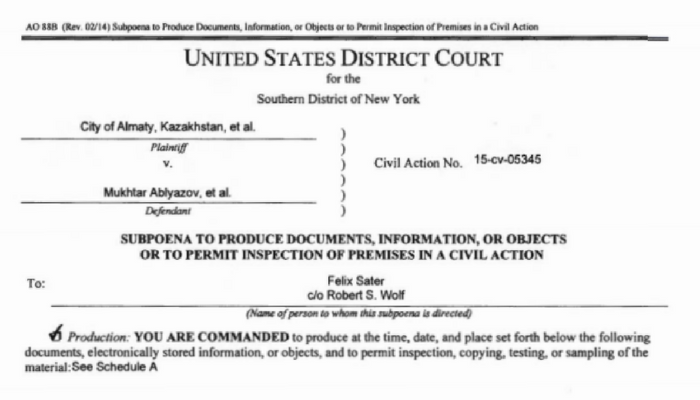 The Kazakh entities allege in their New York court filings that Ablyazov and The Khrapunovs laundered some of these ill-gotten gains into various developments in the United States. Sater’s role as a U.S. intermediary for some of these real estate investments is the basis for the subpoena requests. Although he is not named as a co-defendant, Sater is alleged to have worked with the Khrapunovs on more than $40 million in real estate and investment deals, including $3.1 million that was used to purchase three condos in Trump Soho Hotel. According to Triadou’s motion “there is no reasonable dispute that Mr. Sater possesses relevant information and likely relevant documents”. The court filing does not indicate there is evidence that Sater had knowledge of money laundering or other illegal activities by Ablyazov and the Khrapunovs. Part of the evidence entered into the official court record are emails showing wire transfers from FBME bank, a Cyprus-based bank that was banned by the Treasury Department in 2014 for money laundering and terrorist financing. The defendants used a UAE shell company they owned, Telford International Limited, which had bank accounts with the now defunct FBME. One email submitted into evidence between Sater and Bourg showed the Trump adviser receiving SWIFT bank wire codes needed for transferring money from FBME to people and companies in the U.S. There is also evidence that may tie FBME wire transfers directly to the purchase of Trump real estate. 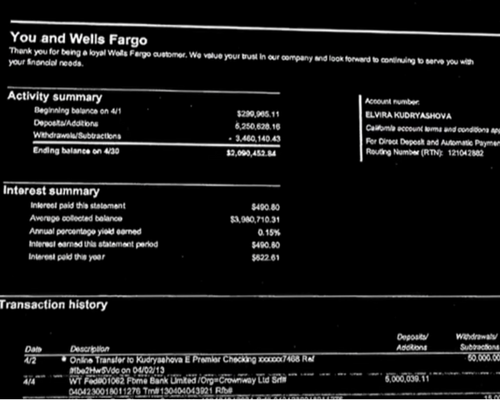 Screenshot of FBME Wire Transfer to Elvira Kudryashova— Zembla Documentary “The dubious friends of Donald Trump part 3: The billion dollar fraud”. Investigative reporting from McClatchy and its partners — Dutch broadcaster Zembla and the Organized Crime and Corruption Reporting Project — found that $5 million was transferred from a Cyprus-based LLC to Khrapunovs’s California-based daughter Elvira Kudryashova. The Cyprus LLC used FBME to transfer the funds to her Wells Fargo bank account. A Zembla documentary traces this deposit from Wells Fargo to New York LLCs created to purchase three condos in Trump Soho Hotel. The condos were re-sold shortly thereafter. In September 2016, BTA Bank and the City of Alamy filed a motion to join FBME Bank in the lawsuit alongside the defendants. The motion was denied in September 2017, with the judge ruling that since the plaintiffs knew about the FBME transfers at the time they filed their lawsuit, too much time had passed for them to be now included. The ruling on FBME effectively eliminated the possibility of obtaining discovery from the bank. A month later in October 2017, Triadou moved to subpoena Sater to fulfill discovery and deposition requests that had been made in 2016. Sometime the following month, Mueller is reported to have requested and obtained the Cyprus bank records from FBME. Peter Carr, a spokesman for the Special Counsel’s office, declined to comment on their ongoing investigation. Simpson may have been referring to reporting last summer from The Financial Times, which revealed “Mr. Sater has now agreed to co-operate with an international investigation into the alleged money-laundering network (including) working with a team of lawyers and private investigators.” Based on the January court filings claiming Sater’s non-compliance with subpoenas, it appears there may be more to the story. According to The Guardian reporting last month, a source familiar with the investigation indicated the FBME records request was related to Paul Manafort. Shortly after this report, FBME issued a statement denying Manafort was a client. Given the timeline of the court case ruling, there is a possibility that the actions of the Special Counsel could instead be related to the lawsuit against Trump’s Kazakh business associates. There is also an additional financial connection between Donald Trump and the Kazakh officials. 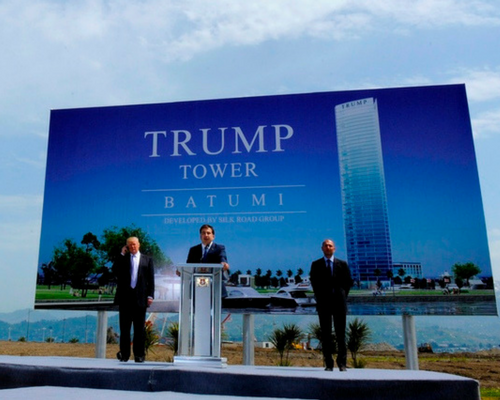 The New Yorker reported that in March 2012, a month after Ablyazov fled from the U.K. to avoid a 22-month prison sentence, Trump traveled to Georgia to announce a licensing deal for a development in the Black Sea town of Batumi. The Silk Road Group, a Kazakh real estate developer financed by BTA, paid Trump $1 million dollars to attend a press tour promoting the partnership. The project stalled soon thereafter, and Trump officially terminated the deal shortly before taking office. Corrected 1/24/18: the lawyer issuing the subpoenas represents Triadou; a previous version indicated that the lawyer represents Nicolas Bourg, the former director of Triadou. Bourg is a witness in the case. Updated 1/25/18: quotes from Triadou’s 1/8/18 Motion to Comply have been added to this report.